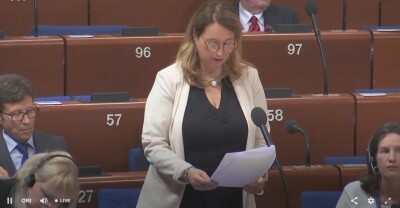 *Strasbourg/CoE/Angelo Marcopolo/- Speaking to "Eurofora", the New CoE's PanEuropean Commissioner for Human Rights, Dunja Mijatović (2018 - 2024), announced that she would "Follow" closely CoE Assembly's Debate on the "Status of Journalists in Europe", Today in Strasbourg. - The main Reason is "because I Intend to Work, particularly, on the Safety of Journalists", i.e. a Topical Issue, which has a Special Importance Nowadays, and that CoE's PanEuropean Parliamentary Assembly wants to Extend to All "Medias' Actors". This became Clear when MEPs Voted to adopt 2 Amendments to a Report on the "Status of Journalists in Europe", which, in Addition to Traditional Journalists, Extended its Scope also to "Other Medias Actors". Mijatovic has a Good Personal Experience of the Issues of Press Freedom and Journalists' Safety, etc., since this area was her proper Area of Action for Years Before, as former OSCE's High Representative on Free Speech for a Long Period, during which she met with "Eurofora", and gave us various Replies to our Questions on several Topical Issues, (as, f.ex. : http://www.eurofora.net/newsflashes/news/oscemediafreedomrepresentativeonwebnewsactors.html + http://www.eurofora.net/newsflashes/news/unrappporteuronfreespeechandechrjudgementsexecution.html + http://www.eurofora.net/newsflashes/news/coepressfreedominturkey.html, etc). - New CoE's Human Rights' Commissioner's Focus on the "Safety of Journalists", in her Statement to "Eurofora" Today, (Comp. Supra), obviously refers also to COE's Highest Political Body, its Committee of Ministers' Recommendation of 2016 (4) on "the Safety of Journalists and Other Media Actors", that Member States were explicity called to "Implement", with an Amendment adopted now by CoE's Parliamentary Assembly. According to that CoE's CM Recommendation, "Ongoing Technological Developments have Transformed the Traditional Media environment, ... leading to New conceptions of Media". In particular, "UN Human Rights Committee has ... stated that “Journalism is a Function Shared by a Wide range of Actors, including ...(those) who Engage in forms of Self-Publication ...on the Internet". The UN General Assembly has also acknowledged that “Journalism is continuously Evolving, to include inputs from Media institutions, private Individuals and a range of Organisations that Seek, Receive and Impart information and Ideas ..., OnLine, as well as offline … thereby contributing to Shape Public Debate” in a Democratic Society. According to the UN Plan of Action on the Safety of Journalists and the Issue of Impunity, “the Protection of Journalists ...should Cover Others ... who may be using New Media, as a means of reaching their audiences”. Indeed, CoE Assembly also Adopted, Today, Unanimously, anOther Amendment, which Urges Member States to "fully implement their Obligations stemming from Article 10 of the European Convention of Human Rights, as regards ...Media Actors' Freedom of Expression, and in particular their Right Not to reveal Journalistic Sources, and their Right to Receive or Impart Information". As CoE Assembly's Legal and Human Rights Committee has already Stressed, in its Written "Opinion", concerning "the Definition of Journalist", "References ... to Protection of Freedom of Expression, including Protection of Sources, and Prevention of Impunity for Threats and Reprisals, should take a Wider ...Aproach, reflecting Contemporary Realities in how Infiormation, Analysis and Comment are Generated and Publicly Shared", (as CoE's Committee of Ministers, and UNO's Human Rights Committee, among others", have "Already" done : Comp. Supra). + By a Timely Coincidence, Today's Move was Combined also with the Official Announcement of mainstream ChristianDemocrat MEP Peter Omzigt's nomination by CoE's Assembly as Rapporteur for the Investigation of the Recent Brutal Murder of Daphne Caruana Galizia, a Dissident and Critical, as well as Investigative Journalist, particularly on Anti-Corruption Issues related to Top Politicians in Malta, where her Car Exploded by a Bomb triggered near her Family Home, (See "Eurofora"s 1st NewsReport on that case, at: ...). 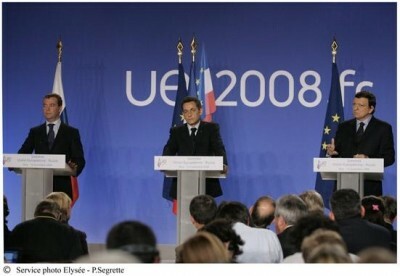 The Victim's Sons had told "Eurofora" that, in Fact, Daphne's former Traditional Media, a Weekly Newspaper, did Not Allow her to really use her Freedom of Expression, since Most or All of her most Critical Draft Papers were Censored or Otherwise Hindered to be Published, Because some Government Agents exerted Heavy Pressure on her former Employers to Skip her Criticism, (f.ex. through the Allocation or Refusal of Paid Government Publicity, Adds, etc). So that she had been practicaly Obliged to Set up her own, Independent, Web-News Media, from which she was Able and Free to Write and Publish whatever she wanted, and whenever she wanted. It was her Sharply Critical, and Independent Investigative Web Media which had, obviously, attracted the Hostility of those who Slyly Murdered her. 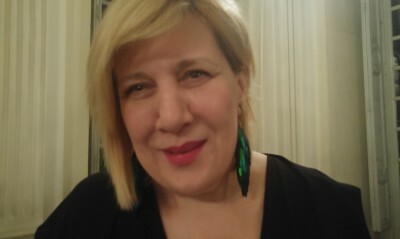 (See: http://www.eurofora.net/newsflashes/news/webjournalistmurder.html , http://www.eurofora.net/newsflashes/news/euparliamentpresidentoncoeandjournalistmurder.html , http://www.eurofora.net/newsflashes/news/daphnewebjournalistmurderenquiry.html , etc). Already, Earlier, the Experienced former Long-Time UNESCO's Director General, and f. Foreign Minister, Irina Bocova, had Issued a Press Release with a Strong Denunciation of the Murder of Miranda Do Carmo, a former Employee in a Brazilian Municipality, who had Created a Local News Website, when he had been Oblighed to Resign from his former Job, and Started to Investigate and Criticize the Management of the New Team, particularly on Issues of alleged Corruption or Other Abus, apparently also in view of the forthcoming Local Elections, where he might have participated as a possible Candidate, (Comp., f.ex., at http://www.eurofora.net/brief/brief/webeditorkilled.html + http://www.eurofora.net/newsflashes/news/unescoheadslamswebeditorsmurderasksjournalismprotection.html , etc). => Such WebNews Publishers, who "are an Essential Source of Independent Reporting and Comment", are "Crucial for the preservation of Political and cultural Pluralism", so that "we (CoE) should Expand the Definition of Journalism, to Include certain Categories" of such Websites, urged, the vice-President of the Socialist and Green Group, Icelandish MEP Sunna Aevarsdottir, speaking on behalf of CoE Assembly's Legal and Human Rights Committee. - "Protecting our Democraties through Critical Reporting and acting as a Defence against Corruption of Power", is a "Role" which "should not be underestimated", since "Freedom of Expression underlies All aspects of a Free Society", she stressed, as far as "the Role and the Status of Journalists" is concerned. + At the Same Time, "57% of EU Citizens" believe that the Traditional "Media are subjected to Commercial or Political Pressures", (and 60% that Public Service Traditional Medias face Political Pressure), showing that the Popular "Trust of Medias is seriously Affected", as the 2017 EuroBaremeter Poll revealed, (and equivalent USA Polls could probably show an even Bigger Popular Rejection of Establishment's Medias), pointed out, on behalf of PACE's Culture, Science and Médias Committee, the President of the "Free Democrats" Group, Italian MEP Adele Gambaro, who was finally chosen to Replace Both Rapporteurs of the "Status of Journalists" and "Editorial Integrity" Reports, whose Authors were Hindered to do so, (Comp. 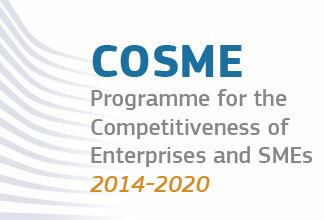 : http://www.eurofora.net/newsflashes/news/changeincoemediadebate.html). Indeed, "as a Result of Technological Progres, and of the Development of On-Line Media, the profession of Journalist is currently undergoing Major Changes", stresses from the outset the Official "Summary" of CoE's Report on "the Status of Journalists in Europe". Inter alia, after "the Collapse of Traditional Funding models, (and) Competition from New Media", (etc), CoE's "Member States should ReView the National Legislation on the Status of Journalists"', and "Explore Alternative Sources of Funding, attuned to the New Media EcoSystem". On this Last Point, Participants to PACE's Debate cited, f.ex., the possibility to Seek Remuneration for Producing Web Content by Sharing the Revenues of Internet Research Websites, (f.ex. such as "Google", "Bing", etc). During the Debates, among others, f.ex. the Representative of the Conservative Group of MEPs Warned Against a perceived Attempt by some, inside PACE's Culture and Science Committee, "to Control the Press", Urging, on the Contrary, to better Respect the "Press Freedom". 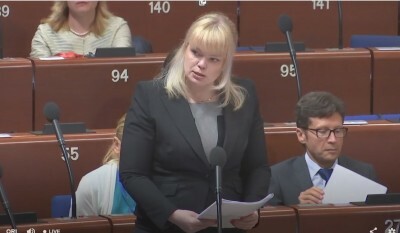 + In Addition, the Representative of PACE's Legal and Human Rights' Ciommittee, repeatedly Denounced also another Strange Trend by some inside the Culure/Science Committee, to Restrict the Legal Definition of Journalism, along Older and Out-Dated Models, instead of adequately Enlarging it, according to New Realities. Indeed, even Corporatist "Trade Unions and Journalists' Associations", etc., are "Called", by the Resolution Adopted Today by CoE's Assembly (PACE), to "Adjust to rapid Societal Changes, including with regard to the Status of Journalists, which should be Adaptable, as its ESSENCE LIES IN THE TASK". => Already, for CoE's Committee of Ministers (Recommendation No R (2000) 7), "the Term <<Journalist>> means any ...Person who is Regularly ...Engaged in the Collection and Dissemination of Information to the Public, via any means of Mass Communication", the Report Adopted Today (25 April 2018) by the PACE observes. >>> From All this, Obviously Results also the Fact that "the Status of Journalist is Not Linked to the possession of any kind of "Press Card", which is Not Obligatory at all, and has Nothing to dop with the Definition of Journalism", as even the Representative of CoE Assesmbly's Committee for Culture, Science and Medias, Mrs Gambaro (President of FDGroup) pointed out. - "In Germany, f.ex., the Definition of Journalist derives Directly from Article 5 of the Constitution, which SafeGuards Freedom of Thought, of Expression, and of the Press, and Prohibits Censorship". So that, "Journalists in Germany do Not have to undergo Formal or Mandatory Procedures. The Profession is Open to Everyone, with No Training or Selection Requirements. German Journalists ...have Always been Opposed to a Binding or Regulatory Legal Definition, Fearing that ... the Political Authorities ...would Restrict their Freedoms", CoE Assembly's Report observes. - According to "the German Association of Journalists", ... a Journalist "Must be Involved in the Production and Dissemination of News, Opinions, and Entertainement, via the Media, by means of Written Articles and Reports, Pictures or Sounds, or a Combination of them". Last, but not least, this Report of April 2018, after Attesting the Fact that, Still, "the Printed Press is populated, almost Exclusively, by Privately-Owned Media", "whereas the (Traditional) AudioVisual sector operates a system where Commercial and Public Services function alongside one another", inevitably also observes that "the Adven of a fully Digital Environment is Radically Transforming the Nature of News Work". But, at least as Funding is concerned, it doesn't go further than to merely propose f.ex. to "Institutionalise CrowdFunding, ...by Giving Decision-Making Power to Donors (sic !) providing More than 1% of registered Capital", i.e. an "Hybrid Model, somewhat Between Foundations and Joint-Stock Companies"... I.e. something "Ideal" in order to Hinder any Media from being Accredited as "Independent Press", since "Donations" are Notoriously considered as InCombatible ! When it states that "the Lack of Legal Definition of the notion of Journalist should Not be a DisAdvantage in itself, as long as there is a Free and Non-Discriminatory Access to Information", it might be true. But, Immediately afterwards, it Starts Pleading for "a Legal Definition of Journalists", mainly in order to "draw a clear Distinction" with what it calls ..."a Blogger" (sic !). => However, a Crystal-Clear and Modern Definition of real and substantial Journalism EXISTS, already since ... 1985 ! >>> Indeed, the InterAmerican Court of Human Rights, has already Designated as Press Medias and/or Journalist the Person who is Committed and Engaged into Regularly Searching, Producing and Publishing Original News Articles on Issues of General Interest to the Society, (See IBID). + More or Less Similar Definitions have been used also by CoE's Committee of Ministers, (already since 2000, but also on 2016, 2017, etc), UNO's Human Rights Council, the UN General Assembly, etc., while this also, obviously, Fits even ECHR's Long-Standing case-Law on Article 10, about Freedom of Expression, (which is the Only Legal Protection for all Medias). In other Words, (as this Report itself said above) : "The Essential is in the Task !" (Comp. Supra). + The World-Famous, Long-Time former Secretary General of the European and International Federation of Journalists, Aidan White, tried to usefully Develop an Idea that we had Discussed with him at the CoE a Long Time ago, by Adding also a Dimension concerning Ethics or Deontology of Journalism, that "Eurofora" naturally Supports (Comp. Supra on this Website). His "Ethical Journalism" Network, and a Landmark Article published at a CoE's collective Book, which suggests an Innovative Solution concerning also pure, Autonomous, Digital Public Writers (or "Publicists", as Americans say, See: ...), obviously advance towards an Interesting Direction. Her Murderers, apparently, knew very well how to Distinguish a Real Investigative and Critical Journalist, from a Routine, Lazy and Selfish Cashy Job Holder, who has Nothing to do what is Best in Real Journalism ! So, what really Happened, with a Strange, Last-Minute "Coup" on Amendements, at this CoE Assembly's Report, later Today Afternoon, looks really Fishy ! Suddenly, the Already Distributed (since Tuesday Late Afternoon) CoE's Official "Compendiums of Amendments" for this Report on "the Status of Journalism", were, Curiously .... Withdrawn, (without anny previous Warning), and, Next Morning, the so-called "Final" Compendium was Replaced by a ..."REVISED" Compendium, which did Not Add Nothing Else than, just one (1) World : ..."Professional" (sic) ! and was Briefly Adopted by a Small Minority of some ...70 Only MEPs, out of the More than + 300 MEPs that CoE Assembly has ! => Given all these Facts, apparently, all those MEPs who had Previously Warned Against alleged Attempts to "Restrict" and/or "Control" real and active Journalism, by some Authors of that Report, (who, finally, were even .. Absent Today : Comp. Supra), after all, might have been, perhaps, Justified ? And, by the way, is it really "Safe" to let just the ... "Swedish Democrats" get the Monopole of a crystal-clear "No !" to such a Controversial move, shortly before the forthcoming Elections, (as it was really the case Today) ?..